Thank you for supporting Filipino Kitchen! Our mission is to raise the profile of Filipino food and community in the US and beyond through blog content, social media, speaking engagements and pop-ups. We share recipes and write about restaurants, markets, chefs, home cooks, personal stories and world history. Politics, too! (Yes, we are going THERE.) We post photos of our mouth-watering dishes, our adventures in grocery shopping, travel and much more. To make sure you don't miss our latest blog posts, you can subscribe with your email address. It's free and delivered hot and fresh right to your inbox. Pinky swear we won't share your email address with anyone else. Before you leave, like us on Facebook and follow us on Twitter and Instagram. FYI, this website and blog is written in English -- not because we're ashamed to speak Tagalog. Actually, we speak Tagalog, thank you very much. And as you'll read, we're both very proud to be Filipino. Thanks for reading. Without you, there is no us. Why geography has everything to do with how and why Philippine Cuisine developed. The Philippines is in southeast Asia. It's an archipelago of 7,107 islands, only 2,000 of which are inhabited. The Philippines' neighbors are Indonesia and Malaysia to the south, Vietnam to the west and China and Taiwan to the north. The South China, Sulu, Celebes and Philippine Seas surround the islands. The Philippine Sea is part of the Pacific Ocean, bordering the islands' eastern shores. The seas have eased trade between people of independent, cooperative societies in present-day neighboring countries since at least the third century. That is over 1000 years before the Spanish arrived, by the way. And even before that? How did the Philippines begin? Currently, scientists don't agree on the geological genesis of the Philippines. Was it volcanic activity, or tectonic plate shifts, or by Ice Age melts that submerging land bridges connecting legendary Lemuria to the west or to present-day Taiwan? Relatedly, historians disagree on who the first pre-historical inhabitants of present-day Philippines were. Physical evidence shows that the first humans settled in the islands at least 67,000 years ago. Situated between the Tropic of Cancer and the equator, the Philippines has a tropical climate. The seas surrounding the islands contain a broad diversity of fish, shellfish and various marine life. The islands have mountain ranges, many rivers and freshwater lakes. The land itself is also verdant with five volcanos and a lush rainforest, now dwindling due to agricultural development. Two thousand years ago, one of the 180 indigenous ethnic groups of the Philippines, the Ifugao, built the Banaue Rice Terraces, steppes carved out of the Cordillera Mountains that maximized and irrigated flat, arable land for rice. Like many other Asian cultures, the major food staple of Philippines was and is still rice. How many people live there today? Approximately 100 million people live in the Philippines. It's the seventh most populated country in Asia. The most populous cities are Manila (the nation's capital) and Davao City in the country's south. Today, there are approximately eight million indigenous people in the Philippines, comprising 60 to 80 tribes, though the 2010 national census proved to be unreliable in its consistency of collecting ethnicity data and collecting information from people living in remote areas. In addition to the Filipino population living on the islands, it's estimated that anywhere from nine to 12 million Filipino citizens live abroad. Economic conditions have led them to seek their livelihoods elsewhere. There are approximately 150 spoken languages in the Philippines. Tagalog, Cebuano, Ilonggo and Ilokano are spoken by the most households, according to the most recent government census. English is also broadly spoken and is one of the languages of instruction. "The Philippines." Street Food Around the World: An Encyclopedia of Food and Culture. First edition. 2013. Print. Who makes all the magic happen? Sarahlynn with her mother, Corazon. Photo courtesy of Cortney Krus. I grew up between two worlds: too Filipino for suburban America, yet too American for Quezon City. But "home" is now several places: Chicago, and the Philippines, too. You second generation folks feel me out there. For Street Food Around the World: An Encyclopedia of Food and Culture (ABC-CLIO, 2013) I ate balut in dark alleys and dirty ice cream on the University of the Philippines-Diliman campus. It was the best first assignment I could have asked for. I've written and edited many of the blog entries you see on Filipino Kitchen, and have contributed to Hyphen Magazine, the country's longest-running Asian American magazine, and to Plate Magazine's Filipino Forward issue, March-April 2016. I wrote the Chicago chapter for 101 Places You Need to Get F*cked Up Before You Die (St. Martin's Press, 2014) and the Filipino chapter for the book, The Chicago Food Encyclopedia (University of Illinois Press, 2017). Natalia with her nephew, Ethan. Born and raised in Metro Manila and in Laguna, Philippines, I grew up in a household that loves food (cooking, baking and eating) but ironically, I was one of the pickiest eaters as a child. Exploring my love for food -- especially Filipino food -- didn't come around until college when my beloved Pinoy food was suddenly out of reach. Lesson learned--you don't know what you have until it is gone. Filipino Kitchen is my outlet to creatively educate people that Filipino cuisine isn't restricted to adobo or pancit... It goes beyond that, and there is always a story behind each dish. We would like to thank Caitlin Preminger, Chef AC Boral, Bert Ganzon, Raven Guerrero, Riko Rosete and the Kultura Festival Board past and present (Ryan Viloria, Mark Calaguas, Christian Sanders, Michael Barin, Tia Adams, Jeffrey Alton, Nasstasha Camba) for their significant contributions to the development of Filipino Kitchen. Nope! While we do collaborate with chefs and restaurants to hold pop-up dinners and similar events, we do not run our own brick-and-mortar restaurant. Do you want to be a restaurant? Not exactly. We haven't ruled out partnering with a pop-up series to establish a restaurant, but all that's very much in the "maybe one day" stage. You keep saying pop-up. What's that? Glad you asked! A pop-up is a temporary restaurant. It's not necessarily held in a traditional restaurant setting, though: it could be held in a private residence or event space, a vacant warehouse, even an alley. Some pop-up folks make regular appearances at street fairs and music festivals or do private catering. Are you going to do an event in my city? Could be! 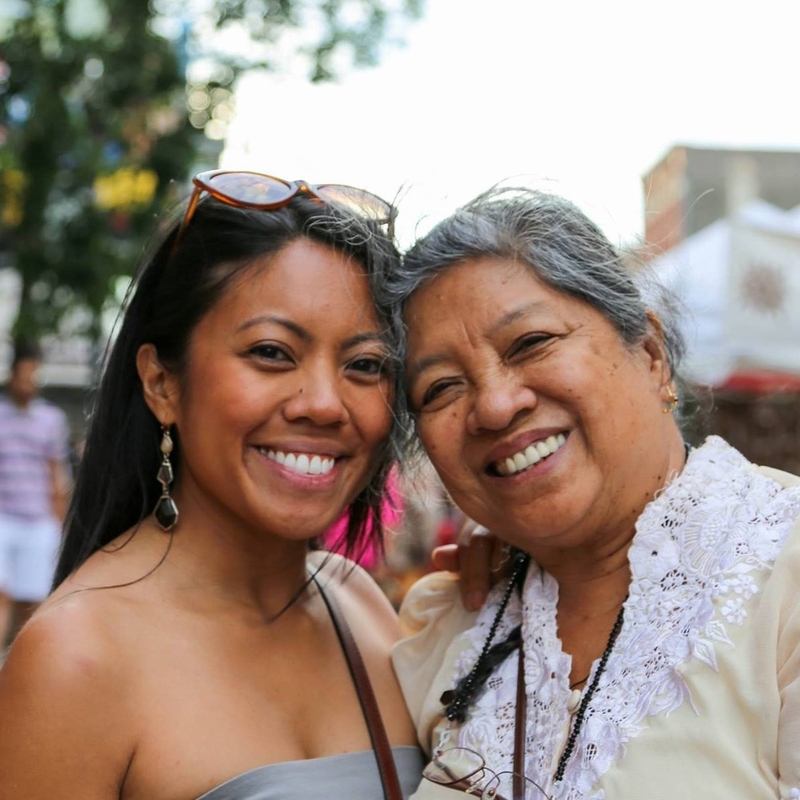 We love to travel and connect with the Filipino community all over the country and around the world. If you know someone who knows someone who knows someone we should coordinate with, drop us a line! Can you tell me where to find Filipino food in my city? Maybe! If you live in Chicago, New York, LA, Boston, DC, New Orleans, London or Paris, we know where to send you. If you don't, ask us anyway! We'll put the question out on the twilight bark and see if anyone knows a spot. Those are pretty cool t-shirts you guys are wearing. Where can I get one? Right here! 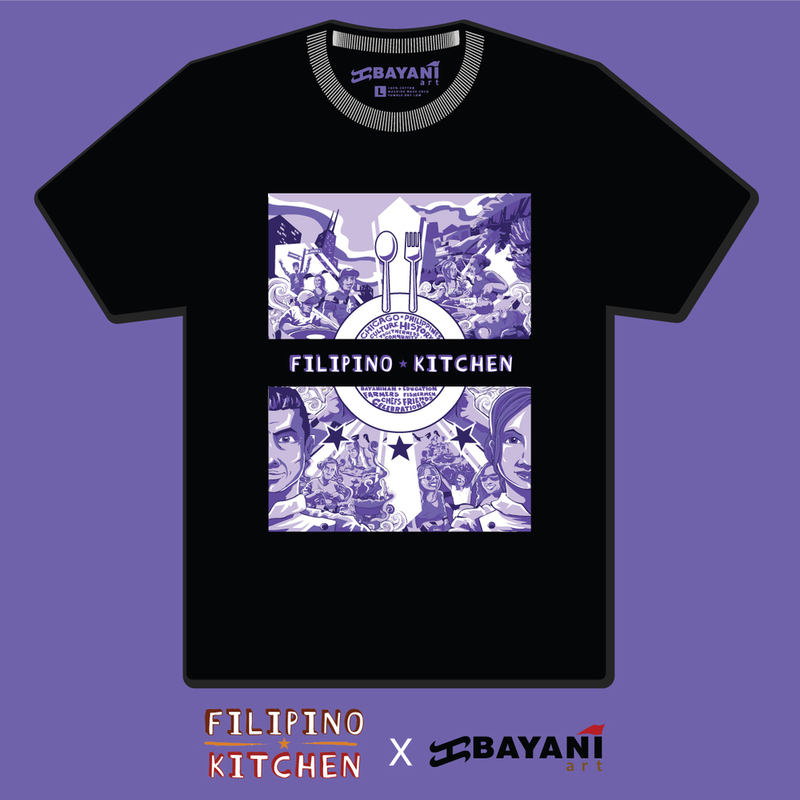 We collaborated with Bayani Art to bring you an original Filipino Kitchen t-shirt, aprons and stickers, too. Shirts are $30 (limited quantities! now only in XS and XL); aprons are sold out (were $35); stickers are $1. Prices include shipping and handling within the continental US. E-mail natalia [at] filipino [dot] kitchen if you're interested. Payment is accepted via PayPal.